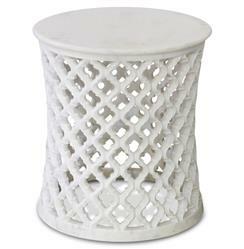 This intricately hand-carved, white marble side table evokes traditional Moorish and Indian motifs with curvaceous patterns and fret work. From the deserts of India, the white marble is exquisitely polished for luxurious luster. The smaller proportions of the end table make it the perfect place to showcase more petite pieces that deserve a place of honor.